Tiny Solar Fan Makes You Look Crazy, But Will Keep You Cool | OhGizmo! By Chris Scott Barr on 07/25/08 • Leave a comment! I don’t know about where you live, but the county fairs are in full swing in my part of the States. I live in the sort of area that is surrounded by corn, and people love to train farm animals to do tricks. It’s also rather hot out, and the people that attend such fairs have no issue with using strange contraptions to keep themselves cool. I really wouldn’t be surprised to walk past a farmer wearing one of these. 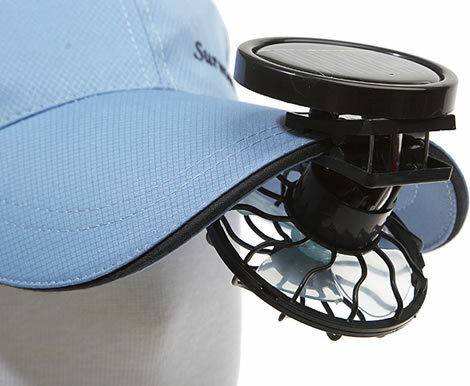 This little fan clips on your hat and gets power from soaking up the sun’s rays. Sure, it’ll probably weigh down your hat, and you’ll look pretty funny, but I guess it beats having a sweaty face. You can pick one up for just $10.